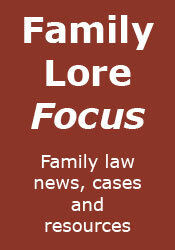 Is the family justice system biased against women? - Demonstrating that it is quite easy to construct an argument either way in the debate as to whether the family justice system is biased. If you want to know what really happened, read the report - Basic advice, particularly for those struggling to research their case without the help of a lawyer. An even better law report database - The Australian version of Bailii. Have a good weekend and Summer Bank Holiday.